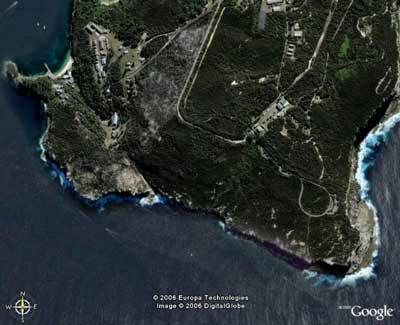 North Head - this dive site is above the end of the word "technologies"
The northern headland of the entrance to Sydney Harbour is called, not surprisingly, North Head. It runs in an east-west direction for over a kilometre and a half. All along this section there is excellent diving, especially when the north-easterly sea breeze is blowing strongly. One of the most popular dive sites is called Old Mans Hat. This is located approximately half way along the head. To the east of this dive site there is another great dive site. This may have a name but I am not aware of it as most people seem to just call the sites on North Head Old Mans Hat or North Head. We decided to call it Old Mans Shoulder as it is located near Old Mans Hat. Anyway, this site is located about 200 metres to the east of Old Mans Hat. Head out to GPS Reading xxxx (to come). When approaching the site, try to come in from the south and you will see the bottom rise from 27 metres to less than 10 metres in a very short distance. Anchor if possible on the deeper section, especially if the winds are from the south. Once you enter the water and descend to the bottom, head south till you are in the deeper section. The depth will be at least 20 metres. The wall is not a continuous single section but is made up of lots of huge boulders and larger rocky sections. Drop away from the wall to the south and the depth soon gets to 24 to 25 metres. There are lots of boulders here with some sand in between. Out even further the depth drops to 26 to 27 metres and the bottom is eventually sand with some small rocks. All of the rocks are covered in beautiful fixed growth. 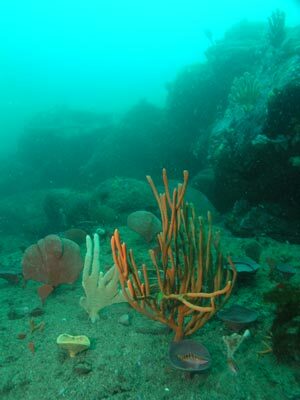 Not only are there sponges, there are sea tulips, gorgonias, lace coral and more. Start heading in one direction. If the tide is incoming, I would suggest heading east, if it is outgoing, head west. In any case, the current here is normally not too strong to inhibit your diving, but you need to take it into account when planning and undertaking your dive. Due to the depth, you will only want to head in one direction for perhaps 10 minutes at the most before turning around. 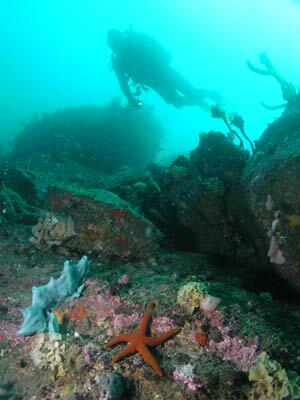 Come back a little shallower to ensure you see more of the dive site. During this section of the dive you are almost certain to see some sea dragons. 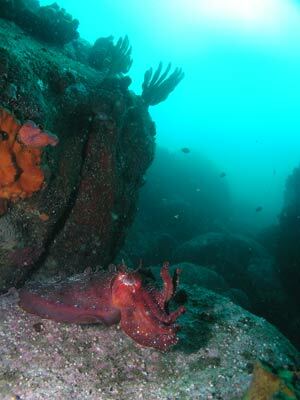 There are lots along the whole section of North Head, so it is an unusual occurrence to do a dive and not see at least one. Closer to the wall there are a few overhangs and cracks formed by the boulders. There are even one or two small swim-trhoughs. In this area look for wobbegong sharks in the cracks and between the boulders. 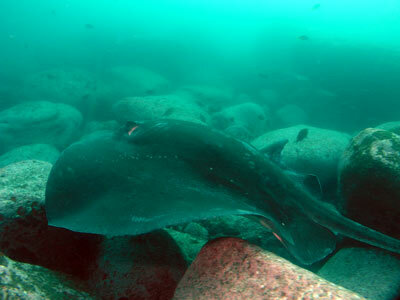 There are also some huge bull rays living in this area. One I saw (see the photograph at right) was at least two metres across. There are also lots of black reef leatherjackets in this area and also the occasional six-spined leatherjacket. Kingfish can be sometimes seen over the reef. Once you are back in the vicinity of the anchor, head further on for a while. When you are closer to running out of no-deco time, come up to the top of the wall. This is about 13 metres, but can be as little as 10 metres. Turn around again and head back towards the anchor. The bottom here is entirely rock, with lots of boulders. The sponge gardens that you saw when deeper are now all gone. The rocks are covered in a pinky growth and there are some small anenomes on many. In between the boulders there are hundreds of one-spot pullers and sometimes ladder-finned pomfrets. Cuttlefish, squid and yellowtail can also be seen here. Go back to the anchor and then, if you have air. continue on again for a few minutes. Head back to the anchor and then north into the shallower water. There are some nice cracks here created by the boulders and you will see lots more fish. You can also do your safety stop here as there are some boulders that come up to about five or six metres. 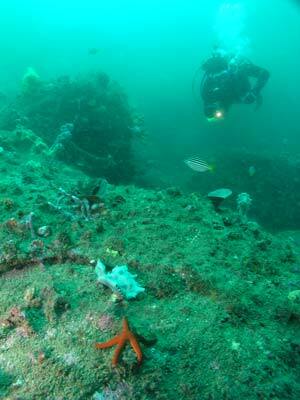 This is an excellent dive site, one of the best in Sydney. It is better done on an incoming or high tide although I have dived here near low tide and had good visibility. Visibility in my experience averages 10 to 15 metres and can get as good as 25 metres. Even if the water on the surface looks dirty, it can be clean on the bottom. The currents are normally not too bad (in fact I have never encountered a really strong one). Be careful when ascending away from your anchor as lots of boats go up and down this part of North Head. Most of the dive charter operators who work out of Sydney Harbour regularly do this dive or one similar to it.